The great thing about staying at a cabin on vacation is you get more rooms and don’t have to squeeze the family into a hotel. The bad thing is you don’t have that sweet, free breakfast most hotel chains offer up nowadays. We didn’t buy any food to cook at our cabin since we were only going to be there three nights. We’re not super big breakfast people anyway so we knew there’d be a lot of grab and go type things. Our first morning in town, however, we had no plans to leave the city so when the kids got up early, we got moving on finding a place for breakfast. There weren’t nearly as many breakfast options as I assumed there would be and nothing really jumped out at me as this is the place we need to go to. I decided to pick something close to our cabin and a chain we’re not really familiar with, but a chain nonetheless, as a safe bet for a good hearty breakfast. 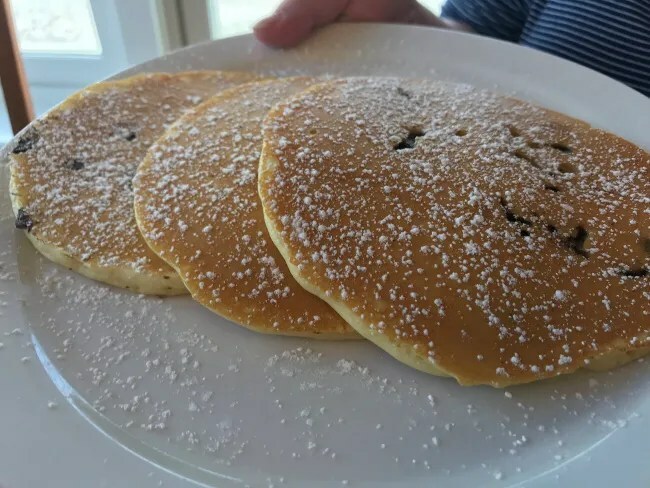 The Original Pancake House is in the luxury resort community of Bay Harbor on the west side of Petoskey. The address on Google lists it as Bay Harbor, but tax records show it’s in the city as Bay Harbor doesn’t exist as a municipality as far as I can tell. 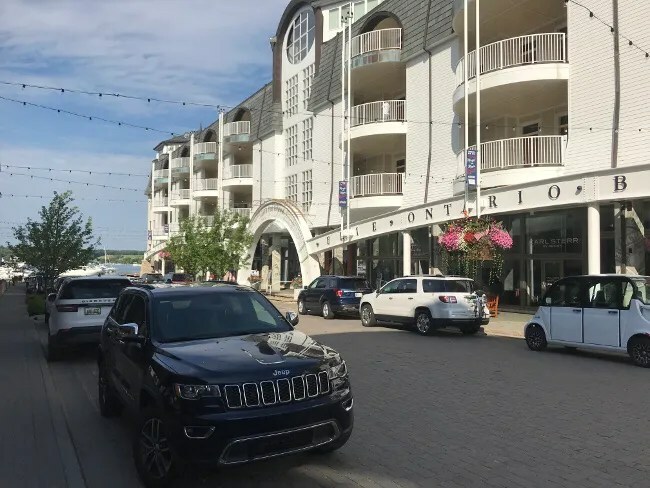 The restaurant is tucked in the corner of a mixed-use development on Main Street that has a number of high end shops and other businesses on both side of the street. The restaurant is in a corner building and it is made to kind of blend in. The bright blue and red logo with a cartoon character doesn’t quite fit the motif of this resort. It’s shocking to me there is a chain in a place like this where most people drive around in golf carts worth almost as much as my house, but there it was. Right on the corner of Main Street and Front Streets. The restaurant is not nearly as big as I thought it was going to be. 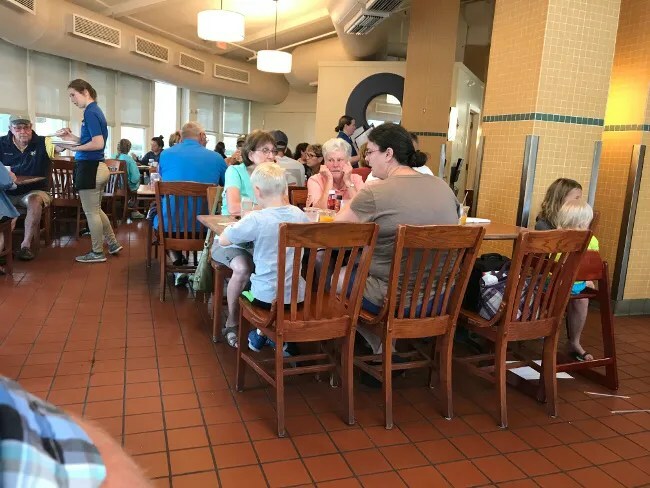 Typically, these breakfast joints are huge and they pack as many people as they can in, but I could tell when we walked in the door at 9:00 AM on Tuesday and there was a back up at the hostess station that it wasn’t as big as I imagined the place to be. The space is very plain with Subway tiles on both the floors and the walls. The tables and chairs are all nice, solid wood though. 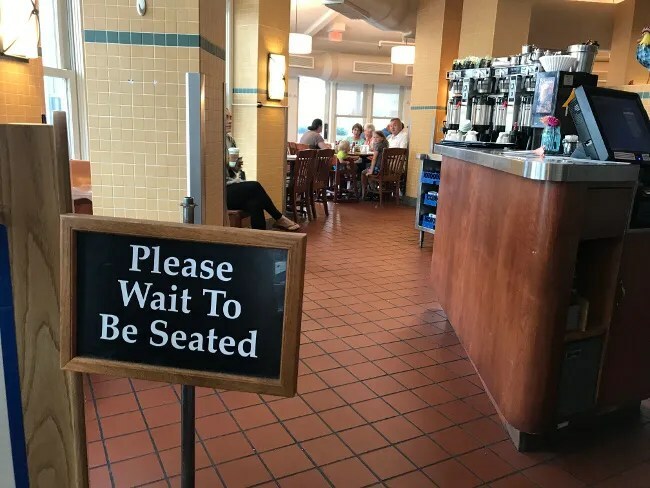 The tables were packed in as tightly as they could be and still be comfortable. 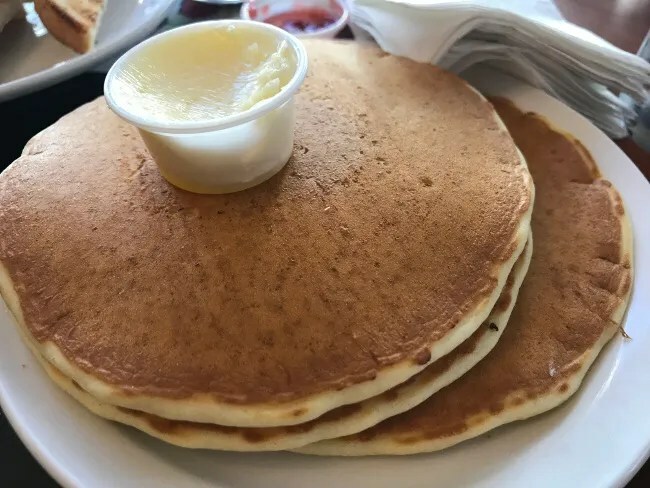 The Original Pancake House only has four Michigan locations and only 100 nationwide. 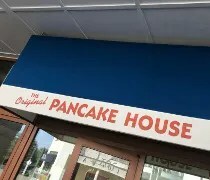 The Original Original Pancake House is in Portland, OR where the headquarters remain. In Michigan, the other stores are all in the Detroit area. The little flapjack flipping guy looked familiar to me because there is one in Oak Lawn where J’s parents live that we have passed hundreds of times. We’ve never eaten there but I knew it looked familiar when I first saw it. J and I both got Coke’s to drink and we kept the kids with water since they’d had a lot of sweets already on this trip. I really wanted potatoes for breakfast and only one of my two choices appeared to come with them. I picked the more expensive Steak and Eggs. 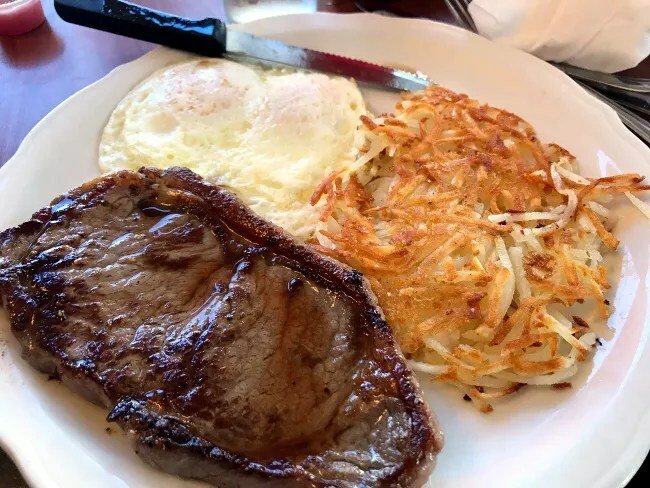 Like most any steak and eggs dish, this one is simple but delicious as long as it’s prepared right. The steak is a 6 oz. choice sirloin I had cooked medium. It comes with two eggs (cooked over medium for me), and hash browns. The plate was cooked perfectly with a tender, juicy, salty, just past slightly pink piece of meat and deliciously runny eggs. The hash browns had a fantastic crunchy layer and they were thin enough that I got that crunch in every single bite. The breakfast came with the choice of either toast or pancakes….and this is The Original Pancake House…so I actually did choose pancakes. The side order is three super fluffy pancakes that come with a little cup of butter and some maple syrup. I don’t like pancakes enough to eat them as an entire breakfast entree but these were a good side and it didn’t take me long to clean my plate. 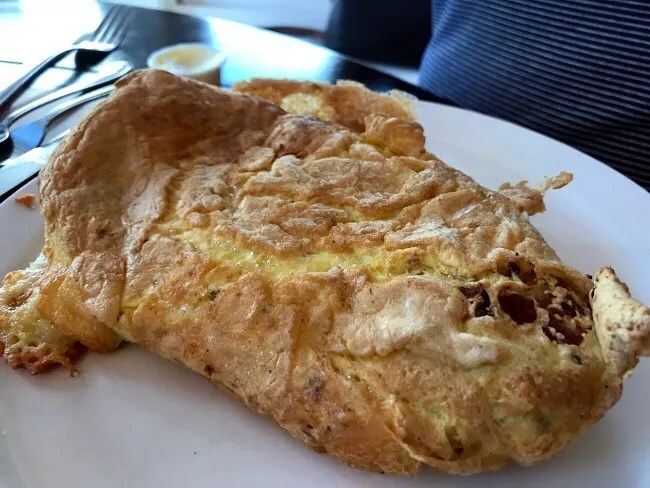 J ordered Aged White Cheddar and Bacon Oven Baked Omelette. The waitress warned us the omelette’s take a little longer to cook because they’re baked instead of pan fried. This huge plate is three eggs filled with a delicious, salty aged white cheddar and crispy strips of bacon. The ends were kind of overdone so J ate out of the middle. The huge tube of eggs was filled with quite a bit of the cheese and bacon. J also got the choice of pancakes or toast but she chose wheat toast. B didn’t really know what he wanted so J offered chocolate chip pancakes. He just heard the word chocolate and lost his mind. The kids plate is three of the same soft, fluffy pancakes with chocolate chips mixed in to the batter. It’s topped with a dusting of powdered sugar and served with syrup that B didn’t use. He ate probably one whole one and we gave a half of one to L who ate some of it. L’s breakfast was just kind of a hodgepodge. All she wanted was toast and bacon so that’s what we got her. 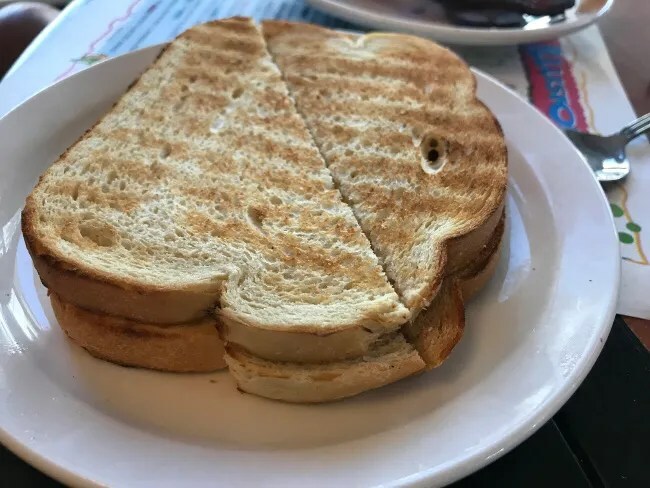 She got two slices of sourdough toast and three slices of thick, crispy bacon. Toast is kind of her breakfast go-to lately and she ate all of that. She needed a little more butter so she took J’s but other than that, had no complaints. She shared some of her bacon with J and I but wouldn’t give up a full piece. 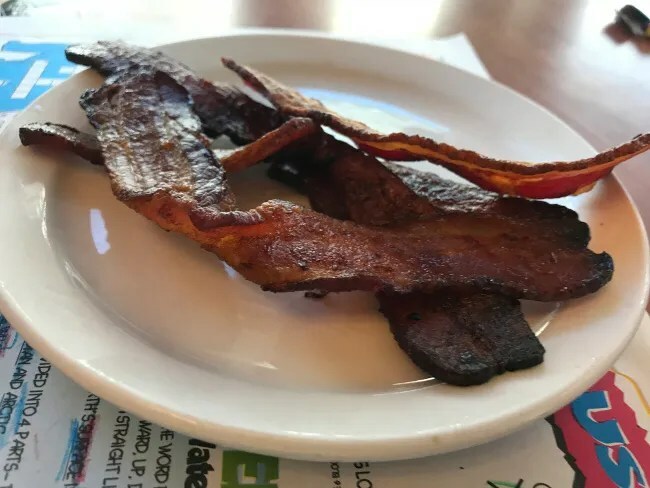 It’s the kind of bacon we all really like. It’s crispy to the point of being just short of being burnt. She couldn’t have asked for it to be cooked more perfectly. Our bill was just shy of $50 which is higher than what I like to pay for breakfast but I did pick the most expensive item on the menu and J picked the most expensive omelette…so that’s on us. 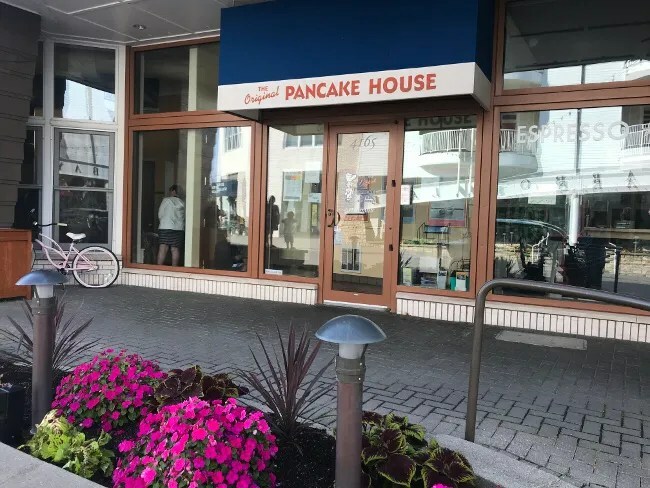 The Original Pancake House was a perfect start to our day in Petoskey. We went from there to Bayfront Park downtown and let the kids play for a while before we gave B a nap and headed out to Petoskey State Park for some swimming.